We are pleased to announce the 9 main tracks of MIXiii-Biomed 2018 Conference. Cannabis’ Therapeutic Promise: Real or Fake? 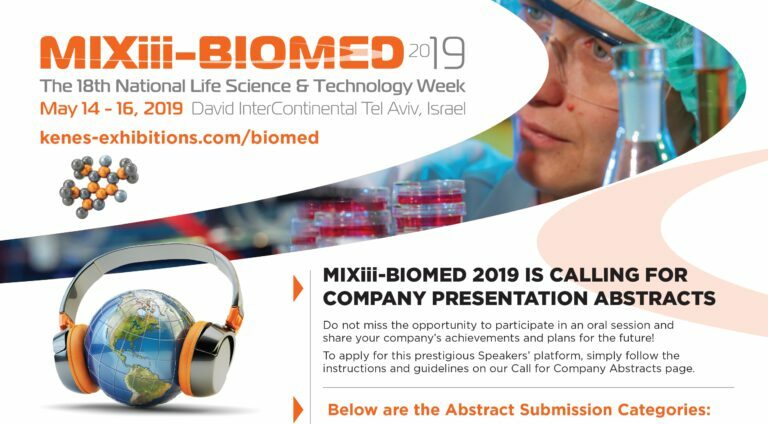 This year’s conference is co-organized by leading Israeli and international healthcare institutions with the objective of exposing participants to thought leaders and experts and allow local and global attendees to mix and exchange knowledge and ideas. Read more about it – Welcome Letter from MIXiii-Biomed 2018 Co-Chairpersons. The exhibition will showcase state-of-the-art exhibits from medical device, biotechnology and pharma companies. Make sure to book a space now and secure a prime location in Biomed exhibition area. Click Here to view Booth Rates. We invite your company to become a Sponsor and not to miss out the opportunity to enhance your brand during this exclusive event! We offer a range of Sponsorship Opportunities and will be happy to discuss tailor-made sponsorship packages to suit your needs.